Warframe has launched Update 13.7, and here’s a rundown of what the team has been doing in Warframe on PS4. Below is a quick recap as to some of the recent major changes, plus what has just launched in 13.7. Tenno have been pitting their resources against fellow Tenno in a bid to control new uncharted areas of space filled with bonus experience and boosted resources. By working together as a Clan or in an Alliance, players can construct a Solar Rail to gain access to these Dark Sectors. The Clan who controls the Sector can reap certain benefits, so pick a side and prepare to defend your Solar Rail from any Tenno who would sabotage your control. Honorable combat at blade’s point has never been so rewarding, and it’s all thanks to the dramatic Melee 2.0 update. Each weapon now has its own upgradeable stance that unlocks a variety of combos to be used when setting aside your firearm in favor of close-combat. Every melee weapon in the game from swords to whips, axes to twin daggers each has their own unique fighting stance, and in most cases more than one! 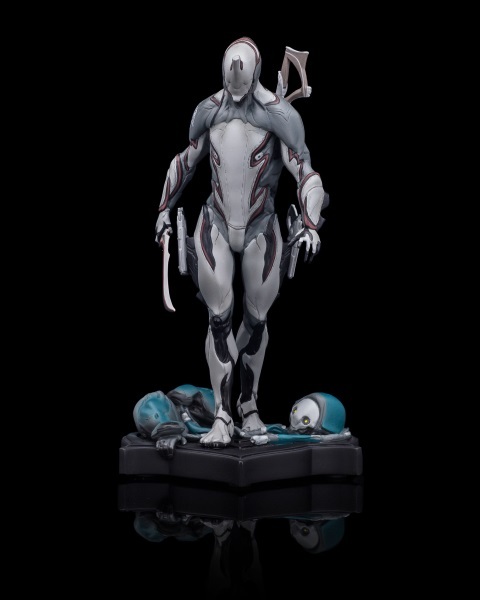 One of the biggest changes since Update 13 was the introduction of our water-based Warframe, Hydroid! Sporting a stylish pirate hat, Hydroid is a unique blend of offensive crowd control — able to call down a ranged liquid bombardment, summon a swarm of tentacles to wreak havoc upon the enemy, and turn into a crashing wave of water that can knock down foes. He also can turn into a puddle and drown enemies inside of himself, which is a strange but satisfying way to deal with the opposition. And that’s not even the latest! If you’ve been enjoying the ride so far, then Update 13.7 should not only give you a few new fun tools to work with, but a new challenge to test your skills against. Fans of being an invisible killing machine should rejoice as our new Prime Access now features Loki Prime, Wyrm Prime, and Bo Prime — all available in a single bundle; and in case the gold trim wasn’t stylish enough, a Prime Accessories pack features the Daman Prime Sugatra and Summus Prime Sentinel Accessories alongside a 90-day Credit and Affinity Booster. Both packs are also bundled with Platinum, and are a great deal if you’re looking to store up for any future purchases down the line. In addition to new content, the Warframe team has added two new Trophies relating to Dark Sectors, one for completing 5 missions for a clan in a contested Dark Sector, and another for earning 100,000 credits in Battle Pay. If you have yet to experience fighting over the Solar Rails and are looking for that 100% completion, now’s a great time to pick a side and join the fight. A new Prime also means a new Orokin Void Tier, and within it are new challenges for players to face. T4 Keys can be earned in Medium (lv 10-20) and Hard (lv 20+) Interception missions on Round 3 or later; which means as long as you’re playing Interception, there’s an excellent chance you’ll be able to unlock our most difficult Void keys yet. Each Void mission also has the chance to spawn a new yet familiar enemy. Corrupted by Void energies, Captain Vor lurks — twisted but infused with incredible power. Already a formidable enemy, Vor can spawn in any T4 mission at random, adding an element of surprise each time you play. The final addition to 13.7 includes new armor customization and weapons for Tenno to mix up their arsenal with. Both The Edo Armor Pack and Yamako Syandana will bring some nice cosmetic options to PS4, while the Serro, Nami Solo, and Pyrana each contribute their own unique kind of death-dealing to the enemies of the Lotus. If you’re looking to mix up the color on your Warframe, be sure to check out the Defaults Color palette as well. It’s a collection of default colors used across every frame we’ve made so far, which makes it a pretty interesting pack to choose from. Between a brand new Prime, new challenges in the Void, and new weapons to master, it’s an excellent time to be a space ninja. Oh, and be sure to watch out for some Special Alerts from the Lotus in the near future. Word has it Alad V is up to something suspicious, so keep your eyes peeled in game (or on your Warframe Nexus app) for any emergency transmissions. League of Angels is now celebrating its mid-year review party for 2016. This is a time for everyone to look back at the year so far. Get your pirates ready to party in Pirate101 today as KingsIsle Entertainment breaks out the prize boxes, decorations and gift codes.